Here we will prove that the sum of any two sides of a triangle is greater than the third side. 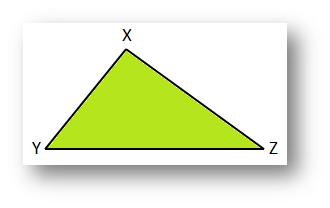 Given: XYZ is a triangle. Construction: Produce YX to P such that XP = XZ. Join P and Z. 3. Therefore, ∠YZP > ∠XPZ. 5. In ∆YZP, YP > YZ. 6. (YX + XP) > YZ. 2. ∠YZP = ∠YZX + ∠XZP. 3. From 1 and 2. 5. Greater angle has greater side opposite to it. Similarly, it can be shown that (YZ + XZ) >XY and (XY + YZ) > XZ. Corollary: In a triangle, the difference of the lengths of any two sides is less than the third side. Proof: In a ∆XYZ, according to the above theorem (XY + XZ) > YZ and (XY + YZ) > XZ. Therefore, XY > (YZ - XZ) and XY > (XZ - YZ). Therefore, XY > difference of XZ and YZ. Note: Three given lengths can be sides of a triangle if the sum of two smaller lengths greater than the greatest length. For example: 2 cm, 5 cm and 4 cm can be the lengths of three sides of a triangle (since, 2 + 4 = 6 > 5). 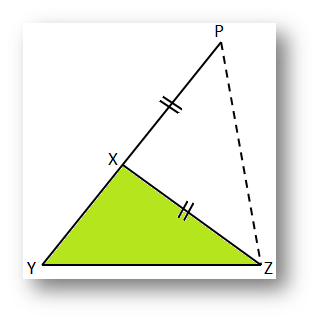 But 2 cm, 6.5 cm and 4 cm cannot be the lengths of three sides of a triangle (since, 2 + 4 ≯ 6.5).